Welcome to the website of Their Voice Foundation. 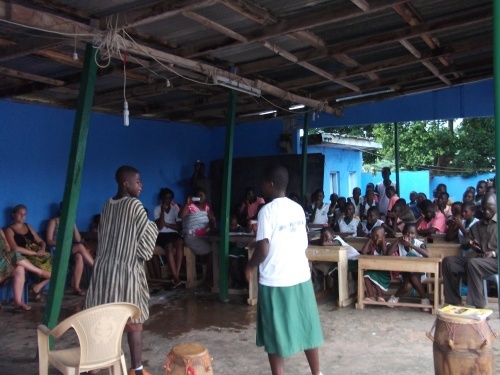 The foundation’s mission is to encourage and improve sustainable development in Ghana and in the Volta Region in particular by supporting projects that use the local and the knowledge and strength of the community members. Support can mean offering financial contribution, but also offering human capacity, transfer of knowledge and material help. We would like to refer to the project support page for more information on the projects we support. We would also like to refer you to the page where you can make your voice count. On this page you can read how you can contribute to sustainable development. You can ask for more information on this page as well. With the name of the foundation we would like to show the importance of the voice of the community members. Our logo is closely connected to the name and mission. In the logo you can see three people that express listening, observing and discussing. We believe that these actions lay the foundation for sustainable development. We would also like to emphasize the importance of collaboration, of unity. The three people represent the community existing of both men and women, young and old.